A gritty and intense thriller, this one really keeps you on the edge of your seat. An incredibly suspenseful and exciting movie, this one turns out to be one of the better drug cartel movies. It is about a specific unit that is tasked with bringing down one of the biggest cartels in Mexico, and the mysterious characters who work for the unit and each have their own agenda. We jump in and join this group by way of Emily Blunt, who represents the fish out of water, audience point of view. She goes on a hell of a ride, first into Mexico, to kidnap a drug lord, and then back to the states, where things get way above what she ever expected. The movie is great in so many ways, including the fantastic look of every scene, the edge of your seat tone it sets, and the way there are so many twists and surprises revealed that allow us to view the material that has come earlier in a whole new light. 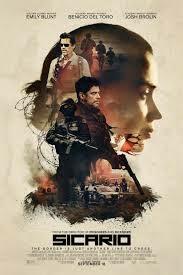 Sicario is the latest movie from director Dennis Villeneuve, a man who is truly on fire, making the most intense and visually stunning movies in recent years. 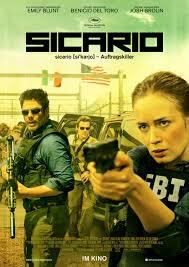 Prisoners, Enemy, and now Sicario. Three movies in there years, all incredibly thought provoking, smart, and exciting films. Villeneuve has been partnering up with Roger Deakins, who is quite possibly the greatest director of photography working today. Together, the two of them made Prisoners look and feel fantasdtic, and now they’ve done it again with this movie, another suspense/action thriller that keeps you guessing and hungry to see more. 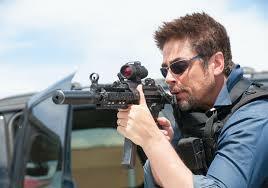 The film opens with a police raid on a compound out in Tuscon, Arizona. It all starts with a very still morning and absolute silence on the screen. We scan the barren, desert landscape, and then we notice a SWAT team member, dressed in full gear, quietly making his way to the house. Cut to the inside of the house where a man is sitting on his couch, watching TV, when suddenly a wall falls down right in front of him. This is the police breaking through.The police raid is wildly exciting. It opens the movie up on just the right footing to put us smack into the heart of things, captured by the edge of your seat tone. There are shootouts here and multiple bodies found in the walls. All of this leads to one of the officers at the scene, Kate Macer (Emily Blunt) being called in for a sort of interview. She finds herself sitting next to her partner, waiting outside of a conference room, with no idea about why they have been brought in. Watching them squirm, and speculate, and scan the room from the glass window behind them, is a lot of fun. When Kate is called in, she meets Matt Graver (Josh Brolin) and a bunch of men who sit at a table and talk about going after the real people behind those compound murders. The first thing that Kate notices is that Graver is comfortably sitting around wearing sandals. He seems like a kind of big shot, who can do whatever he wants. When blunt is asked whether she wants to help get those people, not just the workers who were there at the scene, but the people who were in charge, she responds with certainty and conviction. Graver asks her whether or not she is married. Then he asks if she has kids. Each of these questions lands with a thud of awkwardness and also humor. Kate is driven by her partner to the airport, where she boards a very fancy and expensive private plane. It’s her and Graver and one other man who gets on and doesn’t say very much. This is Alejandro, (played by Benecio Del Toro.) Kate has no idea who Alejandro is, other than that he seems to be an expert on the drug cartels of Mexico. She also doesn’t know who Graver is exactly, and what organization he works for. Once on the plane, del torro has some pretty serious looking nightmares, which blunt notices and even comments on. When they arrive in Mexico, the three of them head to a facility where they are debriefed on their mission. They will be heading into Juarez, one of the most dangerous drug areas of Mexico. Their mission is to extract a leader of one of the major cartels. The trip into Mexico sequence is fantastic. It starts with these four cars driving in, right across the border. There are lots of overhead shots showing the landscape (we also got these shots when the characters were on the plane.) We take note that it is very easy to get into Mexico, but incredibly hard to get out, and packed with bumper to bumper traffic. Once the team crosses the border line, a number of machine gun-manned jeeps are waiting on the side of the road, and join in the procession. There are men riding on the back of these jeeps, standing up behind the guns, and every time there is a bump in the road, these guys pop up into the air. This is all shown to us in closeup and it adds to the detailed visceral energy of the scene. So does the fast paced music. Our characters look out the windows as they drive around, noticing bodies hanging from an overpass. You feel like a massive attack is headed our way, and there’s definitely a vibe similar to the great attack scene in Clear and Present Danger where you see men on the rooftops, setting up grenade launchers and positioning themselves to attack, before they actually open fire. With Sicario, our team members get the drug dealer they were after without a problem and drive him right into the line at the border patrol. Now those armed jeeps veer off and leave our four cars on their own. It’s time to get nervous. Like Alejandro said, as they were heading into Mexico, if their enemies are going to try something, it will be here, at the border. The attack does happen, and it’s incredibly exciting. Assassins show up on all sides, popping out from different cars on the traffic line. All of our team members need to get out of the cars and start firing back. Luckily they are able to survive and put the threat down. They return to the states unscathed, and torture their prisoner to get information. What they find out is that there is a tunnel, between US and Mexico where the drugs come in. At this point, our team busses in a bunch of civilians and have them sitting on the ground in groups. We don’t know what is happening. Neither does Kate. I like how the movie has her ask the questions, threatening to walk, letting us know it’s okay that we don’t fully understand what’s going on. Neither does she. Graver responds to her threat by giving her answers, which is something else that I like. You expect him to call her bluff and tell her to walk if she wants, but he doesn’t. Instead he asks what she wants to know and then he and Del Torro explain it all. From there, we head to a bar, where Kate meets a guy with while she’s about to have a one night stand when something unexpected and exciting changes the whole game plan. The climax of the movie starts with s plan to raid the tunnel, but it ends up going in a very different direction than we might have expected. The tunnel business is just scratching the surface. When Kate takes a wrong door and sees something she isn’t supposed to, we suddenly end up following a different character across the border, on a mission that we didn’t even realize would be happening (at least not this way.) And it’s fantastic. This new and unexpected mission is action packed, but also eye-opening. By the end of the movie, we do get answers to any question we were wondering, and those answers come fully loaded with twists and turns. They cap off what was already an excellent film. This movie quite possibly has Traffic beat (the film that Del Toro won an Oscar for,) as the best drug cartel movie there ever was. It’s just one of those films that is incredibly exciting, keeps you glued to the screen, and makes you care enough to demand answers. It’s a hell of a movie and absolutely one of the best of the year.